In 1961, Fluxus was christened (and loosely organzed) by George Maciunas, a Lithuanian-American who eventually worked to establish "Fluxfestivals" in Europe. Paradoxically -- meaning, in this case, fittingly -- the word "flux" refers to both "flowing" (as in water or energy) and "fusing together" (as in soldering metals). Maciunas and his fellow Fluxites were inspired by Dada, the mocking, anti-traditionalist art movement that came out of World War I, pioneered by artists Tristan Tzara, Marcel Duchamp, Hugo Ball and Jean Arp. The apparent irrationality, the deadpan jokes at the expense of the political and art establishments, the use of pointless mechanisms to satirize technology and science, the love of paradox and inversion and mass-manufactured products: All of these Dada traits re-appeared in Fluxus (which was originally termed "Neo-Dada"). Fluxus deliberately set out, Maciunas wrote, to purge the world of "dead art" and "bourgeois sickness" through a "fusion of Spike Jones, gags, games, vaudeville, Cage and Duchamp." In the early '60s, Yoko Ono's performance efforts (what Maciunas called "neo-Haiku theater") and composer John Cage's experimental music -- with his use of random sounds and silence -- were major influences on Fluxus. Flux artists specialize in noise music, brief performance works, puzzles and games, as well as "intermedia." They refuse to conform to the restrictions of paintings or sculptures or theater, preferring to blend or muddle them. Curiously, Fluxus has also been influential on architecture because of Maciunas' early interest in prefab buildings. 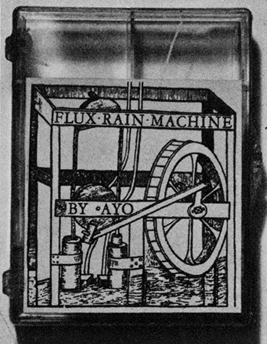 A typical Fluxus project was Maciunas' Flux Rain Machine (right), a little, clear plastic box with a bit of water in it. The water condenses and forms droplets on the inside of the box. Voila -- rain. Another plastic Fluxbox by Keith Buchholz holds a pair of dice. The cover declares, "Roll 13 and Win!" But a pair of dice can only add up to 12. Voila -- futility and the illusion of easy prosperity. One reason that Fluxus isn't more widely known, I'd suggest, is that its ideas and elements were various (and contradictory) enough that they could easily morph into or be absorbed by the larger waves in '60s art, particularly pop art and conceptual art. To a degree, both of these also had origins in Dada, so the flow of Fluxites into their ranks is not surprising. Even so, Flux artworks are often distinguished by their manufacture: They're cleverly made from cheap, ordinary, even crappy materials, including human hair, cardboard, string, discarded books, clothing, broken crockery and novelty-store items. These "found objects" are deliberately not employed for museum-quality masterworks. The pieces are ephemeral and disposable, even self-destructive. They're more like junk. With a sense of humor. Jon Hendricks is a Fluxus scholar and the curator of a major Fluxus archive, the Gilbert and Lila Silverman Collection, which was recently donated to the Museum of Modern Art in New York. HENDRICKS: "Maciunas' idea of Fluxus was to move away from art that was something precious to something where art can become a part of everyday life." A utopian, Maciunas deemed that the entire 'art industry' -- museums, theaters, galleries, concert halls, everything -- should die and be replaced by radically simple artworks that anyone could do. He also disliked the idea of the heroic individual artist. He preferred collaborative and group efforts. Which inspired his use of boxes. He borrowed the idea from Marcel Duchamp's Boite-en-Valise and Joseph Cornell's famous shadow boxes. But for Maciunas, Hendricks notes, the box isn't a way of framing and fusing together disparate objects through a single artist's sensibility. 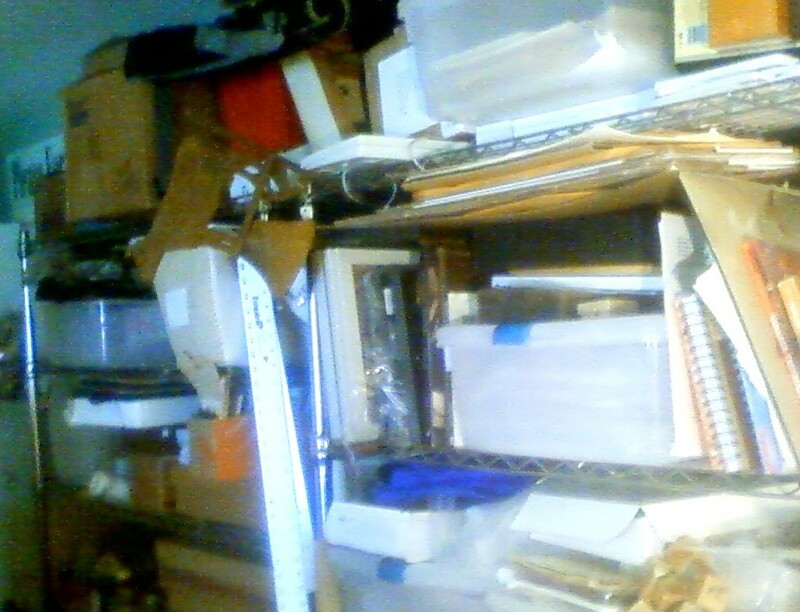 A box is a way to contain contributions from dozens of artists. They're like little museums that way -- or anthologies. Indeed, Maciunas' first boxes were called "editions" and they were like yearbooks, compiled annually from various efforts by Fluxites. In Fort Worth, Touchon's mail exchanges with other artists and his boxed-up collections eventually led to his assembling Fluxhibition #3 at UT-Arlington -- which he was able to do very quickly with works submitted from around the world. The show is sub-titled "Thinking Inside of the Box." It features 140 kits, cases, tubes, cans, birdhouses, bottles and containers -- including a piece by Yoko Ono herself, a limited-edition, yellow Japanese box containing a poem, "We're All Water" (above). Through the course of the exhibition, we see the box as utility item and metaphor, the box as a little stage, as board game, toolkit, toy set, parfait glass, map case, juggling pin, animal cage and laboratory sample -- just about everything, perhaps, except the box as coffin. Touchon likes to point out that even a website can be a box -- and he's created several linked, Flux-related "web-boxes." In fact, his entire exhibition is mounted to the walls of the gallery on shelves made of the cardboard boxes that will be used to ship it to its next home. It's a touring show -- in a box. But -- is it Fluxus? Scholars like Hendricks see Fluxus fading after 1978 with Maciunas' death and with the other Flux artists going in new directions (echoing what a number of early Dadaists did when they turned to Surrealism in the '20s). So Fluxus belongs to a specific historic era -- just like Impressionism or Cubism. Today, you could call your artwork Fluxus or Cubist, and Hendricks says, it still could be interesting. But it won't have the same meaning, the same revelation. Times change, people change. What was fresh can now feel repetitive or irrelevant. HENDRICKS: "Movements do tend to have a kind of time frame, a period when they are essential, when they have to exist." Touchon argues that this is the way collectors and curators think, not artists. Collectors want movements to be limited to a period, a place, a canon of select works. This increases the value of their own collections. Ironically, Touchon himself is clearly a manic collector. But for him, while Flux artists may play with boxes, Fluxus itself can't be contained in one. The impulses behind Dada and Fluxus, he believes, resurface during certain periods (World War I, the Cold War, the Bush years). Besides, he notes, over the years, Fluxus works have often been produced by artists in their spare time (making an actual living at it would be directly counter to Maciunas' ideas. It should not be a surprise that he died impoverished). For them, Fluxart is a low-cost sideline, as it were, a way to stretch the aesthetic muscles, an intellectual game that doesn't have to pay the bills. TOUCHON: "I think this is one of them here..."
So -- has Touchon ever thought of rental storage? TOUCHON: "Well, I'm considering that at this point. But I'm still actually organizing the collection to tell you the truth. [Laughs.]" Fluxhibition #3 runs through July 31 at the E. H. Hereford University Center Gallery at the University of Texas at Arlington. Cecil Touchon has already posted a call for contributions to Fluxhibition #4: Fluxus Amusements, Diversions, Games, Tricks and Puzzles. This story originally appeared on Art & Seek, and you can go there to hear the audio version. Jeez, another Fluxus blog having to do with something other than the clothing line. Cecil appears to be very talented though! 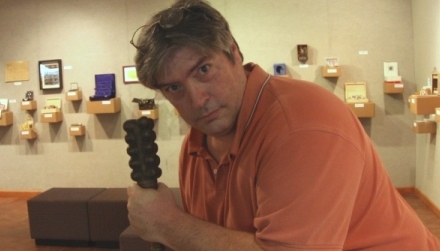 Fluxhibition #3 was a real labor of pure love, fueled by Cecil's talents, skills, and dedication to art and fluxus. 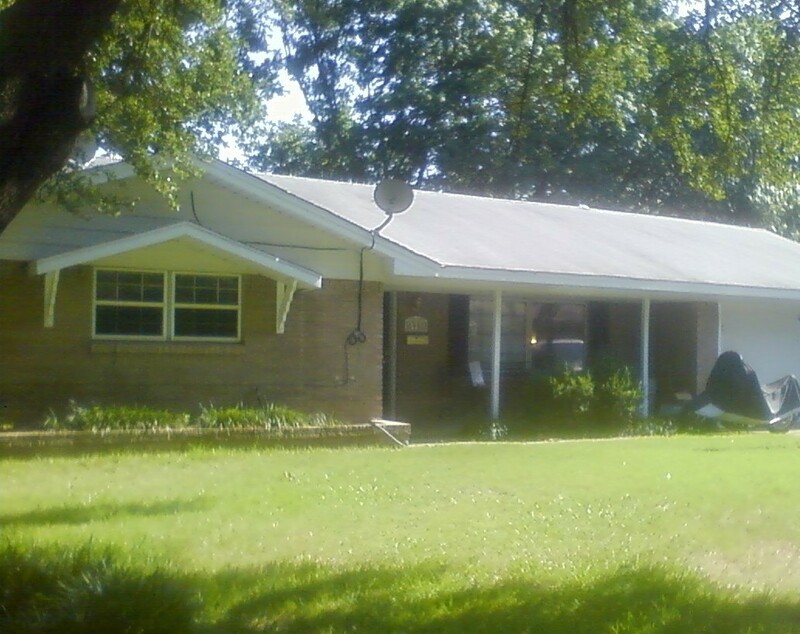 This page contains a single entry by book/daddy published on July 15, 2009 10:44 PM. All that glitters can be sold was the previous entry in this blog. Big-City Texas in the '80s: Black Water Rising is the next entry in this blog.